In the environment that we live in there are various types of fungi present everywhere. The dark, moist surroundings created by the shoes and socks we wear, make the feet and nails especially susceptible to fungal infections. 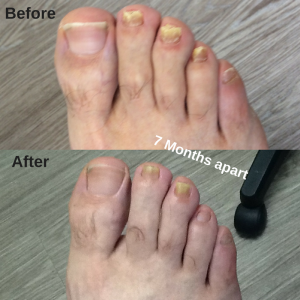 Fungal infections of the nail bed, matrix, or nail plate are responsible for approximately 50 percent of all cases of thick, discoloured toenails. Most fungi are harmless until they penetrate the skin. A fungus that invades the skin or nail through minor cuts, after injury ir repeated irritation to the toes can cause the nail to separate from the nail bed. Fungus may cause the nail to thicken and become yellowish or brownish in colour. As the fungus grows, foul smelling, moist debris can be seen. 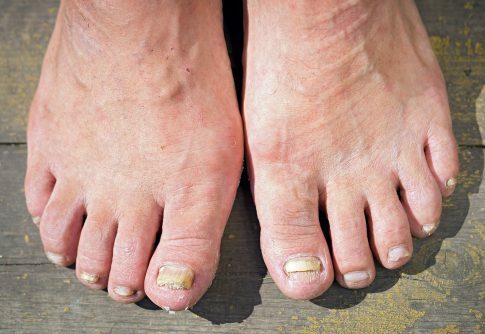 Pressure from the thickened nail or the build up of debris may cause the toe to become quite painful. The accumulation of debris under the nail plate can often lead to an ingrown nail, or a more serious bacterial infection that can easily spread beyond the foot. If you think you suffer from a fungal infection, an appointment with Dr. Chaudhry is warranted. 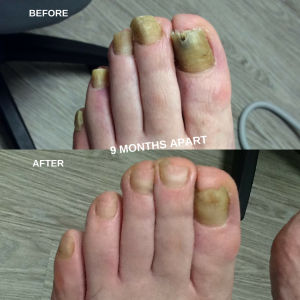 Fungal infections in your toenails can be difficult to get rid of (longer you wait the harder it is), but with the right treatment plan, you can get rid of it. Book an appointment with Dr. Chaudhry to discuss the right treatment plan for your condition.